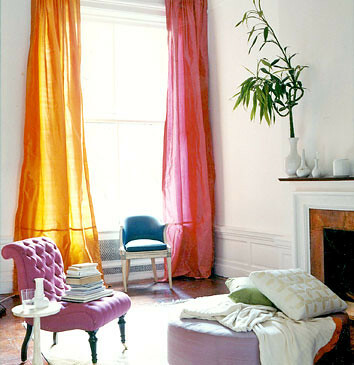 Colorful silk curtains, inspired by Prada palette, upload feito originalmente por xJavierx. The orange-and-pink curtain combination was inspired by Prada. "Como" curtain fabric, Silk Trading Co., "Brewster" armless chair, George Smith, "Sunflower" side table, Jayson Home and Garden, throw, Stella (in New York), "Liwan" green pillow, Layla (718) 222-1933, Linen pillow, Rebecca Omweg (646) 290-8319, "Ushak Berber" rug, The Rug Company. Photo by Melanie Acevedo, Domino, April 2007.